The 14th International Swimming Federation (FINA) World Championship is held in Shanghai on July 16, 2011. The 16-day event attracts more than 5,000 athletes, referees, officials, and 1,500 journalists from 180 countries in the world. The FINA World Championships started in 1973 and is held every two years. It includes five major events of swimming, diving, synchronized swimming, water polo, and open water swimming. Currently, the number of FINA members has reached 180, second to that of the Federation of International Football Associations (FIFA). 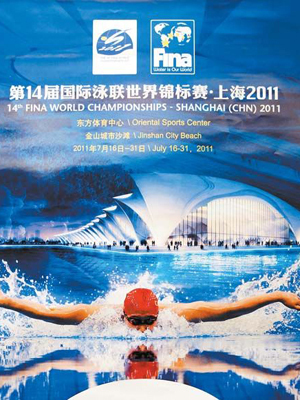 Shanghai won the bid to host the 14th FINA World Championships on March 24, 2007. This is the first time that the FINA World Championships is held in China and the second time in an Asian country, following Fukuoka of Japan who hosted the competition in 2001. The 14th FINA World Championship is the largest sport event ever undertaken by Shanghai in terms of the scale and the number of participants. The main stadium for the competition passed post-construction tests on April 17. The Oriental Sports Center is a comprehensive stadium including a main gymnasium, swimming pool, an outdoor diving pool and a media center.